Every time I wish there were some way I can automate something in OSX, I find out there is a way, through the nifty scripting utility Automator. 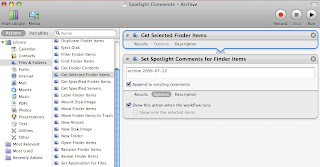 I had a particular problem I wanted to solve, which was to add spotlight comments to multiple items. This way I can do dynamic searching of files based on keywords instead of creating an entire folder hierarchy and having to drill down to get to a specified file. 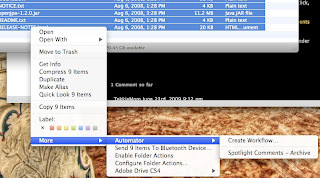 And here's my Automator plugin in action, accessible right from the finder menu. Slick!